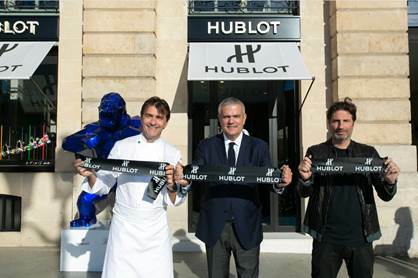 June 22nd, 2018, Paris (France) – It is at the heart of the 1st Parisian arrondissement, on the famous place Vendôme that Ricardo Guadalupe, CEO of Hublot next to Hublot Ambassadors, Richard Orlinski, the French sculptor and Artist, and Yannick Alléno, the three Michelin star Chef, officially inaugurated the freshly renovated Hublot Flagship. 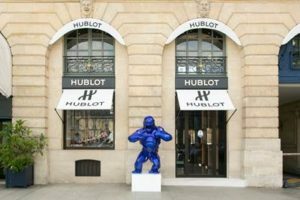 Earlier in the day, Hublot and the Richard Orlinski Galerie had the Parisians and passers-by experience a full-scale treasure hunt through the streets of the capital in pursuit of a unique “Wild Kong” of the artist. Following its steps, the best tracker found the Mick Blue “Wild Kong” in front of the Hublot Boutique at Place Vendôme. Created for the occasion, the Kong proudly bore the eponymous square’s column on his chest. 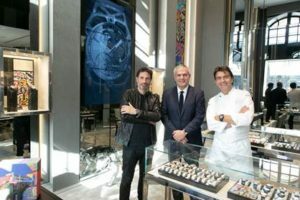 In front of the Vendôme Column, at number 10, the Brand’s Parisian flagship store has been entirely thought over: bringing together luxury and modernity, bathed in sunshine thanks to the broadening of its exterior window, this space exemplifies Hublot’s motto, “The Art of Fusion”. 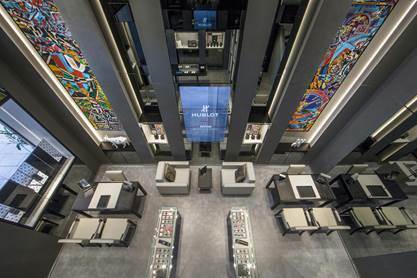 Adorned with prestigious materials like polished brass and grey alcantara, this new Boutique also features an interactive table with which, using touch screens, customers can make the Hublot watches appear and disappear. Paying tribute to the Art World, the ground floor is decorated with giant Pop Art paintings inspired from the iconic Big Bang range from Hublot. As the sun set on Place Vendôme on this first day of Summer, Ricardo Guadalupe and Richard Orlinski, a Hublot Ambassador, welcomed the guests of this special evening in the courtyard near the Hublot Boutique. In a friendly, modern and casual atmosphere, this moment of sharing was all about the Fusion of the Arts. Almost two hundred privileged guests could taste the refined cuisine prepared by three Michelin star Chef and Hublot Ambassador Yannick Alléno, one of the most famous representatives of French Cuisine throughout the world. The works of art of Richard Orlinski – expressing his « Born Wild » concept – showcased for the occasion mirrored the Hublot timepieces. From the wish to create a sculpture which gives time emerged the Classic Fusion Aerofusion Chronograph Orlinski. Facetted like a sculpture thanks to the three-dimensional folding of its case, in either titanium, King Gold or blue or black ceramic, sometimes adorned with diamonds, this collection blends art, materials and watchmaking know-how: that’s the Hublot way!